"The border's closed, Jake said. No one can get into Scotland, just like no one can cross the Channel . . . This is England and it's no longer a free country. The Government can track anyone, anywhere, from a chip implanted at birth. But Jake has escaped from his Academy orphanage, and he needs to get to Scotland with his dog, Jet. 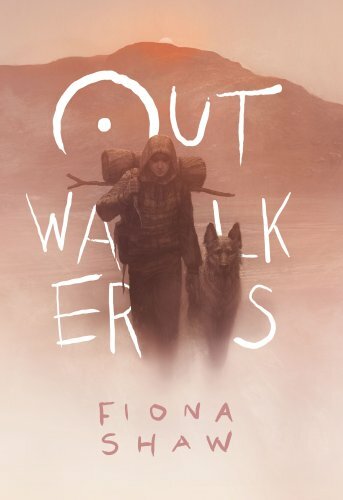 When the Outwalkers gang grabs him, they go off-grid while the Government hunts for them. The closer they get to Scotland, the more dangerous it is. Because now, it's not only their own lives that are at stake . . ."
In some ways the description made me think about V for Vendetta. Or parts of A Scientific Romance by Ronald Wright. But the combinate of the cover and the description instilled in me a deep hunger to read this book. And what an excellent read it was. I devoured the book in five sittings over three days. This book was incredibly hard to put down, and if I was not in the middle of some major projects at work, likely would have sacrificed a night's sleep to finish it in one sitting. This is a story set in a future where Britain has isolated itself from the rest of the world. They have passed laws, and no one is allowed out and no one is allowed in. This was done, the people have been told, in part because of illnesses and in part because of religious bombings. Rule one is no technology. Two is be outside. Three is be hidden, and four is obedience to the gang. "The gang always comes first. So if you join us, and you break a rule, the leaders can kick you out. That's it. No questions, no second chances. Just out. And we have done it already, kicked kids out." Soon the 7 of them find themselves being hunted. Because of circumstances they end up in London and then bad situation turns to worse. But they also begin to realize that the pursuit of them is about far more than just them being 7 unchipped outwalkers! This story is very well written. The characters are amazing. When the story ends you will be left wanting more. Wanting to find out what happens to the others. Wondering if there will be more books set in this world! Fiona Shaw has written an excellent novel and I highly recommend it.